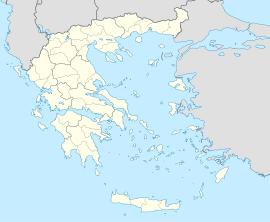 Acharnes (Greek: Αχαρνές, pronounced [axarˈnes], before 1915: Μενίδι Menidi, pronounced [meˈniði]) is a suburb of Athens, Attica, Greece. With 106,943 inhabitants (2011 census), it is the most populous municipality in East Attica. It is part of the Athens Urban area. The northern part of the municipality is covered by the forested Parnitha mountains. The southern part is in the plain of Athens, and is densely populated. The built-up area of Acharnes, in this southern part of the municipality, is continuous with that of the adjacent suburbs to the west, east and south. The centre of Acharnes is 11 kilometres (7 miles) due north of Athens city centre. The two other settlements in the municipality, Thrakomakedones and Varympompi, are situated further north, in the foothills of Parnitha. Acharnes is crossed by several important roads and railways, including Motorway 6, the Piraeus–Platy railway and the Athens Airport–Kiato railway. The Acharnes Railway Center is the main railway junction of Attica. Acharnes is home to the Folk Art Museum of Acharnes. Acharnes was named after the deme Acharnae (Ancient Greek: Ἁχαρναί), a subdivision of Athens in classical antiquity. The Athenian playwright Aristophanes characterised the inhabitants of Acharnae as peasants in his play The Acharnians. Acharnes suffered significant damage from the 1999 Athens earthquake, being very close to the epicenter. The municipality has an area of 149.956 km2, the municipal unit 146.406 km2. The Folk Art Museum of Acharnes is a museum in Acharnes, a northern suburb of Athens, Greece. It was founded in 1977 by the local Greek Mountaineering Society, which also formed the Historical and Folklore Association in 1981, to which it bequeathed the museum in 1982. The archaeological part of the collection was then separated from the historical and folklore material and was given to the Hellenic Ministry of Culture. Former Minister Melina Mercouri founded for it the Archaeological Museum of Acharnes in a neoclassical building in the central square of Acharnes, which had formerly housed the local City Hall. The same building houses the Historical and Folklore Society and its Folk Art Museum to the present time. ^ "Population & housing census 1991 (incl. area and average elevation)" (in Greek). National Statistical Service of Greece. ^ "Folk Art Museum of Acharnes, Acharnes". zoohara.com. Archived from the original on 20 March 2014. Retrieved 20 March 2014. ^ "Folk Art Museum of Acharnes". kitgan.com. Archived from the original on 20 March 2014. Retrieved 20 March 2014. ^ "info | Folk Art Museum of Acharnes". shelf3d.com. Retrieved 20 March 2014. ^ "Acharnes Folk Art Museum". touristlink.com. Retrieved 20 March 2014. Wikimedia Commons has media related to Category:Acharnes. Wikimedia Commons has media related to Category:Tomb of Menidi.